When I'm preparing for a trip, this is how it usually goes: I start shopping for a few pieces to bring a few weeks in advance, I start working on my packing list (it's a process) a few days in advance, and then the weather forecast inevitably changes, and I basically have to re-plan all of my outfits. That's when it always becomes clear to me that there's one thing, in particular, that I'm lacking: an appropriate jacket for my travels. Without a doubt, outerwear is the biggest challenge I have when it comes to packing. I've yet to put my finger on exactly what the problem is, but even though my closet is filled with outerwear options, including denim, leather, utility, wool, and faux-fur jackets, I always feel as though my destination and the outfits I've chosen for it require a very specific type of jacket, and one is hardly ever enough. Sure, I'll throw in a denim or leather jacket for a few occasions, but what if I'm going to a wedding, or a fancy dinner, or even a Spin class? Then what? That's usually when I get out my laptop and frantically search the internet for something that isn't too bulky and won't wrinkle easily (I personally hate wearing my jacket in dirty airplanes, even though that's what you're supposed to do). My frantic last-minute search usually leads me to order a jacket that I otherwise probably wouldn't have chosen, and usually with an added price of $25 overnight shipping. So here's my best advice: If you, too, experience this packing challenge, do yourself a favor and diversity the outerwear options in your closet in advance. It will save your time, money, and sanity. Below, shop 17 stylish jackets with travel potential for this time of year and beyond. 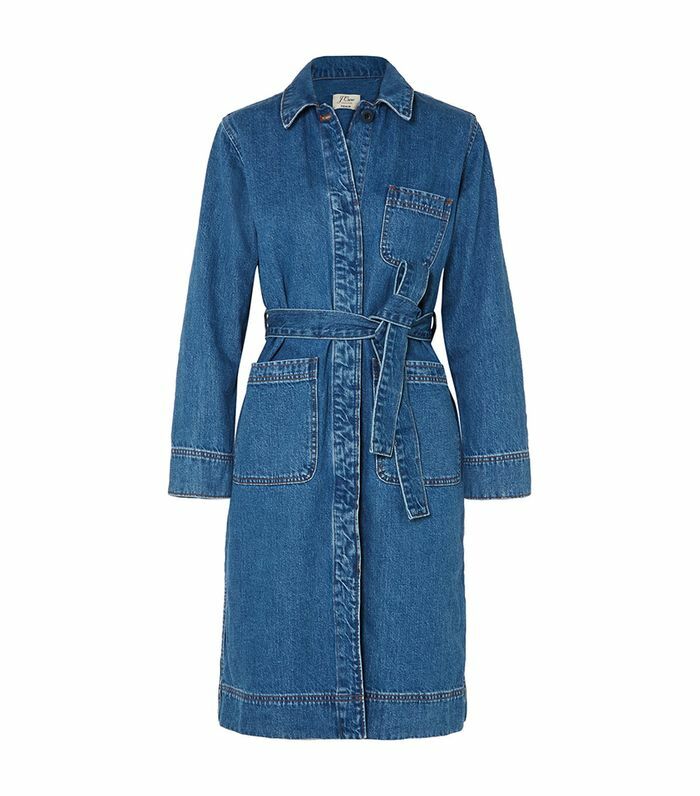 This denim coat is polished enough for an evening out or a work function on a business trip. Good luck finding an anorak that's chicer than this. Was there ever a more perfect travel jacket than a trench? I think not. A lightweight puffer-style jacket is perfect for transitional weather. This color this time of year is a win. This is more versatile than you think—trust. Early reviews are saying that this new arrival is very flattering. This lightweight leather jacket is my favorite one to travel with. I would literally plan outfits around this jacket. Contrasting stitching is a subtle trend I'm loving. This will take up minimal room in your suitcase. Denim jackets are a travel must-have. I purchased this one for a recent late-winter trip and wore it every day. Let this rekindle your love for the bomber jacket. Take my advice and invest in a versatile non-bulky wool coat. This will easily elevate anything it's paired with. I would like to go to London and wear this coat. And now, here's the only packing checklist you'll ever need.